VATICAN CITY (CNS) — Praying for victims of violent protests and targeted attacks against the church in Niger, Pope Francis said no war can ever be waged in God’s name. He asked that the Lord grant “the gift of reconciliation and peace so that religious feelings never become an occasion for violence, suppression and destruction,” he said Jan. 21 at the end of his general audience talk in the Vatican’s Paul VI hall. 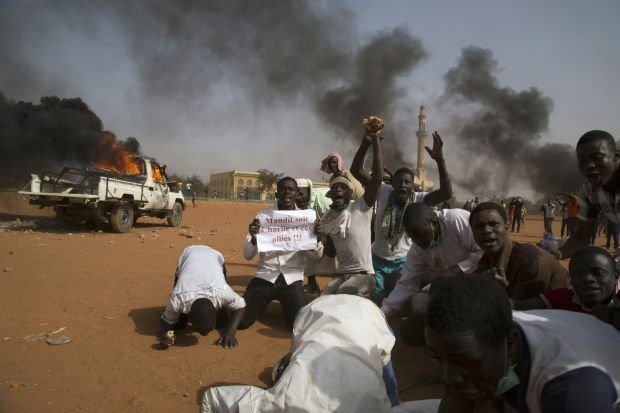 Protests were held in Muslim-majority Niger Jan. 17 and 18 over the publication of cartoons mocking depictions of Islam’s prophet Muhammad by the French satirical newsweekly Charlie Hebdo. Islamist terrorists killed 12 people at the publication’s Paris office Jan. 7 as retaliation for the mockery. At least 10 people were killed, more than 170 people injured and 45 churches set ablaze after protests erupted over the weekend in Niger. Some hotels and bars were also burned, according to news reports. The dioceses of Maradi and Niamey saw the most damage, with Catholic churches and religious residences set aflame or attacked. Redemptorist Father Nicolas Ayouba, the order’s superior in Niger, told Fides that six churches and two convents were sacked and burned in Niamey. Sunday Masses had been suspended because of the violence, he said Jan 21. “All of our churches, 12 out of 14, have been completely ransacked; there is nothing left … everything has been burned to the ground. Only the cathedral is left standing” because he called for increased security there, he said. Catholic schools and clinics have been closed, he added. “We cannot understand what is happening,” he said, given so many years of peaceful coexistence. The 63-year-old French-born archbishop has served in Niamey since 2003. The archbishop added he believed the protests had been manipulated and the violence organized by outside groups. Many religious men and women “have lost everything,” he said, yet they had been protected by and still are being helped by Muslim families.